. .. it’d be done tastefully and with a view towards what the Mustang SVO was scheduled to become had it remained in production. Ford was testing a DOHC cylinder head for a future SVO in the mid-eighties (three were known to be built for testing), as well as an independent rear suspension. 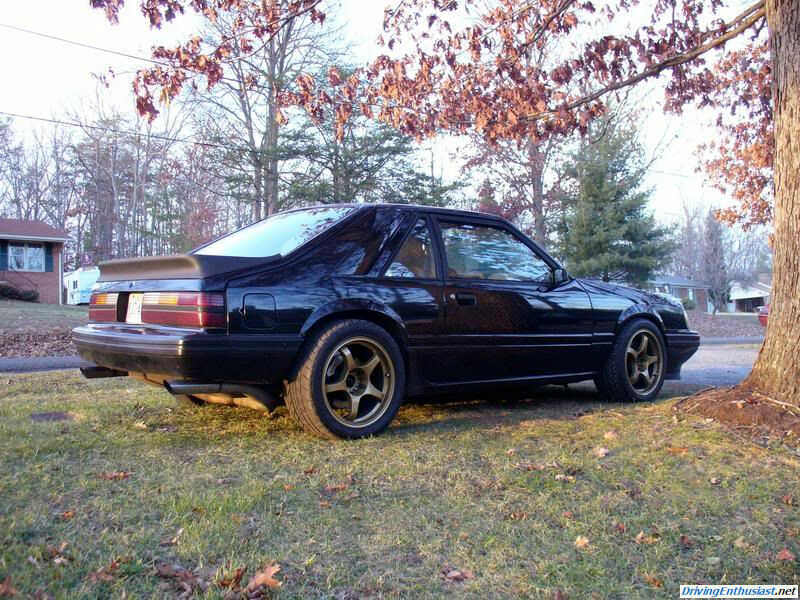 Yes, it’s almost unbelievable (and very frustrating) that in the 1987 timeframe we could have had a world-class Mustang! That never-to-be-seen SVO is what we’d model our “resto-mod” SVO after. We would not be interested in trashing one with modifications that would take it away from Ford’s original philosophy in building the SVO in the first place. That has been done too often to SVOs, and there are too few left to waste on foolishness. Form-follows-function; tasteful and refined. So if we were to proceed, cautiously, there are examples to look at and decisions to be made. The IRS is a no-brainer, and an easy bolt-in. It’s purpose is entirely in keeping with the SVO mantra. The bigger question is the engine. Ford has several DOHC 4 cylinders to consider using, including the state-of-the-art MazdaSpeed3 engine (which is basically, after all, an engine design straight from Ford). In fact, if we’d care to wait until 2015, we could use a next-gen Ford EcoBoost 2.3 liter DOHC 4 cylinder straight from the base 2015 Mustang. But that would probably be cheating. Instead we could take the route of using the original 2.3 liter engine as a base, as Ford was planning to do with a planned DOHC engine for the (cancelled) 1987 SVO. B234F Volvo twin cam head, flows about 30-40% more than a stock head. Earl’s fittings and lines for oil and water plumbing. The only rubber lines are the lower and elbows for the upper radiator hoses and the conectors to the heater core. ECU: Megasquirt v3.0 Board w/ latest MS1-Extra firmware and a very drivable tune and decent but rich WOT tuning. Setup with MSD box currently, using PIP for ignition input to ECU. PWM Injector noise fix has been done on this unit. The question from the list above is whether an entire Volvo engine is used, or as the list implies, only the cylinder head. And if so, how was the head mated to the SVO engine block? We think it might be the cylinder head only, as the SVO forums have some reference to this but – unfortunately – no details. Lets examine the pictures of the car above. This is the engine – and we are intrigued. 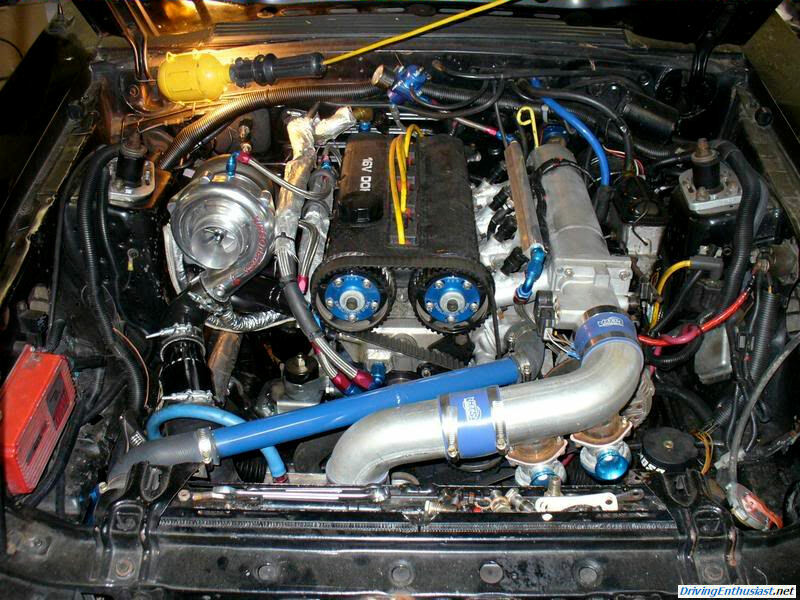 If we wanted to stay with a 4-cylinder turbo, a DOHC head would be exactly what’s needed. A V-6 SHO engine might be a better all-around choice, an even easier swap, but it wouldn’t be in the spirit of the original car. A Duratec 4 would be a good choice if the original spirit of the car was to be preserved, and there are no shortage of parts for that engine. The SVO is a handsome car, as we’re reminded once again looking thru these pictures. In this example, we can see that the upper half of the decklid spoiler is missing – this is a common problem. And that the exhaust reveals a Cobra IRS.. You can always tell an IRS car from the rear by the exhaust system that it requires. We’ve wrenched a Cobra IRS transplant ourselves, and it’s an easy conversion (except for the brake line connections, which need to be fabricated in anything earlier than 1998). 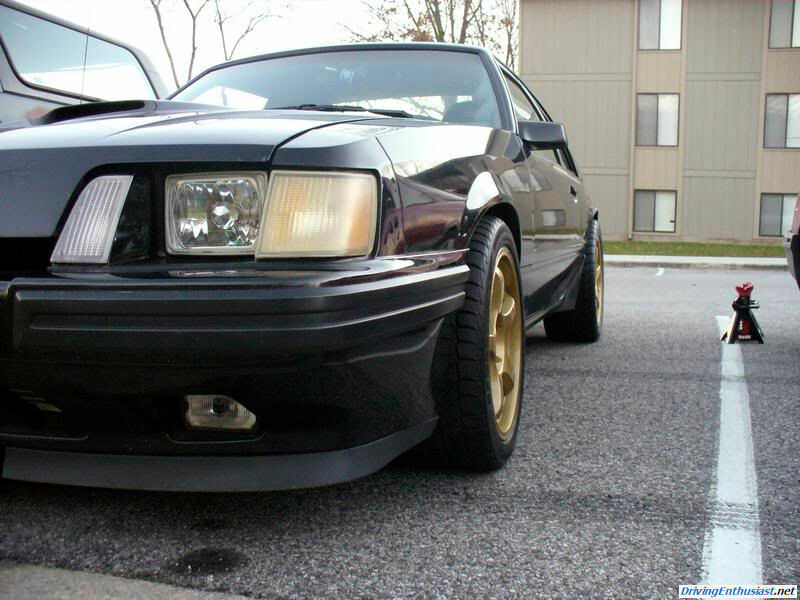 The base car is a 1984 Mustang, so it doesn’t have the aero headlamps that were used from 1985 1/2 thru 1986. But it also means that it original had a single exhaust, and that the fuel pump was mounted under the rear passenger seat area where a second muffler would be located on a dual-exhaust car. It’s be easier to start with a 1985.5 car so that the fuel plumbing is already in place and so that dual exhaust can be used. You can also see in this picture the wheel offset which was used. It is very difficult to get the wheel offset right in Fox cars since different offsets have to be used front/rear. And it’s worse in this example, since SVOs used a unique front suspension which had its own offset questions. There is also the Cobra IRS, which again had its own offset requirements in the SN95 cars it was designed for… transplanting one into a Fox chassis requires an even more extreme offset. That’s something the builder didn’t do right here, IMHO. Our own Mustang SVO looked similar to this: for a short period of time we had Recaro seats in ours. The standard SVO seats are really excellent, although they don’t provide as much lateral support as these do. 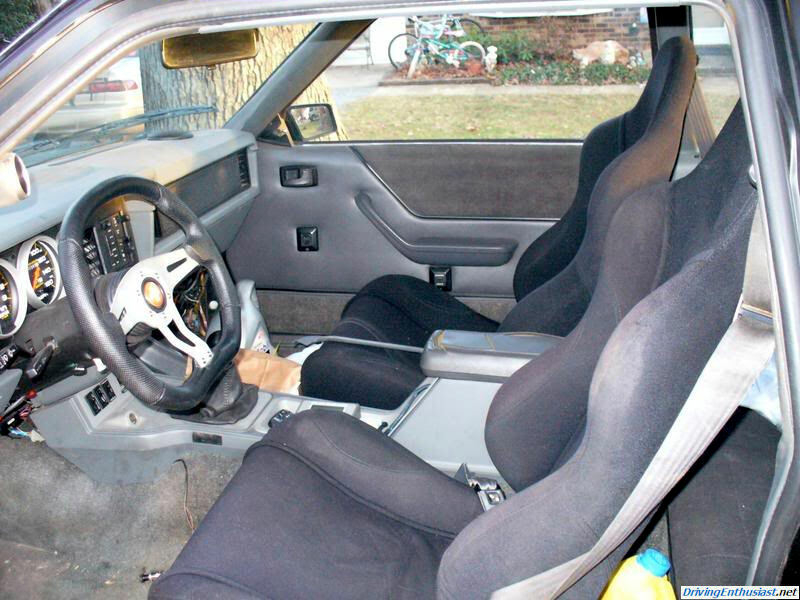 The builder here used a set of sport seats and a replacement steering wheel from unknown vendors. There is no doubt that the SVO needs a modern DOHC cylinder head.. the original head was a cast iron SOHC design, and even worse it used a unique splayed intake manifold where each runner was a different length and entered the head at a different angle. Adding a MAF and coil-packs to replace the distributor would also be a good idea… that’s a known science with Mustang SVOs. Should we have just bought this SVO from the builder? We’re been wondering about that… the cylinder head conversion really intrigues us, and the Cobra IRS is always a favorite route for us. But it’s too late now… this car has disappeared back into the ‘net. Also, the owner honestly reported some issues, including a slight oil leak into the coolant, but perhaps better understanding this cylinder head would help resolve that issue. We really want to find out more about this cylinder head swap. We’re getting interested in obtaining a Mustang SVO again – we were an original owner and have a unique history with the original car. Before the car came onto the market, we worked in the pits at the 24 hour endurance race at Nelson Ledges were Ford tested the prototypes for two years before production began. We have the inside story of that event here: http://www.drivingenthusiast.net/sec-ford/special-report-svo/index.html. Then we bought our own when they came onto the market. It was a great car, far more sophisticated and capable than the lowly Mustang GT of its time. Hence the interest in obtaining one. Several members of “TurboFord.org” that have done the swap: search for “Folvo” or “Volvo swap”.